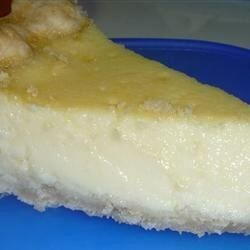 "Excellent Egg Custard Pie recipe that I've worked at forever to duplicate a popular restaurant's pie! I finally got it!" In a large bowl, combine eggs, sugar, salt and vanilla. Mix just enough to incorporate all the ingredients. Set aside. In a medium saucepan over medium-high heat, combine milk and butter. Use a wire whisk and stir constantly until the milk begins to rise in the saucepan at a rapid boil - 5 to 8 minutes. NEVER stop stirring, or the milk will burn. Pour the hot mixture into the egg mixture, stirring as you pour. Line a 9 inch pan with dough. Pour custard mixture into crust. Protect the edges of crust with a ring of aluminum foil. Bake in the preheated oven for 20 minutes. Remove foil and bake for 8 to 10 minutes. Filling will appear slightly jiggly. Allow to cool. This was okay...too much of an eggy taste. I tasted scrambled egg all the way. If you like eggs this is the one to try. I am a custard lover and this was just not for me. It tasted like french toast and did not have that "custard" consistency that I expected.